Amphenol-BSI have been designing, assembling and testing backplanes for more than 30 years. 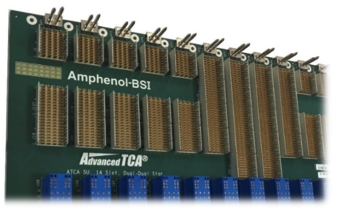 Amphenol’s experience of interconnect design, manufacturing, development and electrical test technologies allows Amphenol-BSI to deliver the highest performance backplane at a product cost you can bring to the market. As part of the Amphenol Corporation, we continue to invest in our technologies to ensure we remain positioned as the most extensively tooled Backplane Supplier in the industry. Modern demands on data, latency and security requires a new generation of product. Data rates are growing exponentially, and this is driving the evolution of communications technology to meet those demands. This evolution in technology requires an advancement in the design, manufacture and test of your products. Amphenol-BSI are uniquely placed to provide that advancement as you move your product to the next generation. We provide the products of today, while safeguarding the technologies of tomorrow. Our backplanes range across the full technology spectrum. From PICMG 33MHz CompactPCI to market leading Ethernet 56G PAM4 signaling. Our Engineering capabilities, infrastructure and Global presence positions ABSI at the forefront of backplane and enclosure design. Industry leading assembly and test technology. Advanced PCB capabilities and partnerships.